Strawberry season is still upon us and I’ve heard many folks thinking out loud about what to do with all their strawberries! How many more jars of strawberry jam can their pantry hold? As a awesome* fantastic alternative, make this pie because, A.) you’ll use three pounds of strawberries, B.) it won’t take up much room because it’ll be be gone in a flash and C.) two words: strawberry pie. yum! (okay, that was three). 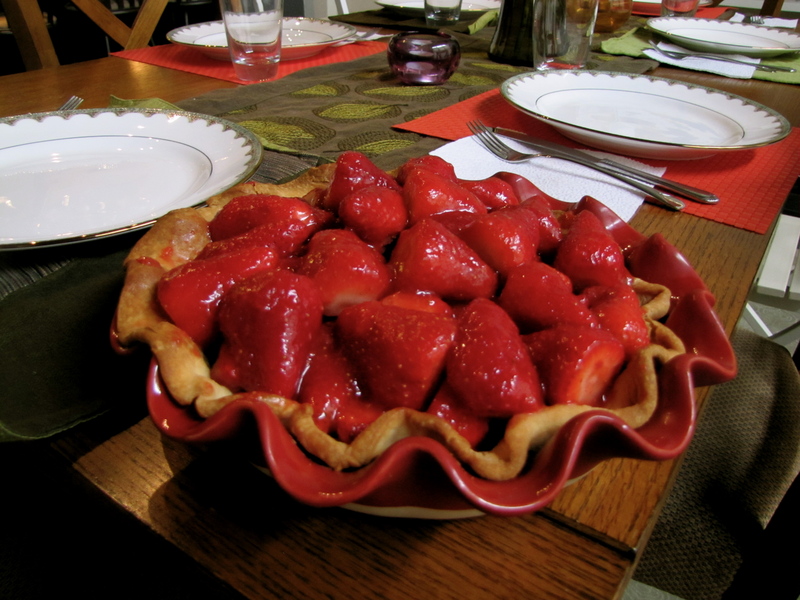 Make it for Father’s Day, Memorial Day, July 4th…so many summer holidays to make this pie for! *per a discovery by James, I use these words too often on my blog! 2. Select 1 1/2 cups of strawberries that are misshapen, underripe or otherwise “unattractive.” Place in food processor and process until they become a smooth puree, 20-30 seconds. 3. Whisk sugar, cornstarch, sure-jell and salt in medium sauce pan. Add berry puree and cook over medium-high heat, stirring constantly with rubber-proof spatula, and bring to a full boil. Boil scraping sides and bottom to prevent scorching, for 2 minute sto ensure cornstarch is fully cooked (mixture will appear frothy when it first reaches boil, then wil darken and thicken with more cooking). 4. Transfer to a large bowl and let cool. Stir occasionally to let heat release. 5. Pick over remaining berries and measure about 2 pounds. Halve only the extra-large ones. Add berries to large bowl with glaze and fold gently with rubber spatula until berries are evenly coated. Transfer berrie into pie shell, piling into a mound. 6. Refrigerate for at least two hours and serve within 5 hours of chilling. 7. For whipped cream: using an electric hand-mixer, mix heavy cream with 1 T. of sugar or 1-2 tsp. of cinnamon. Add dollop of whipped cream on top of pie.